You’re thinking about a vacation. You’ve visited the websites, ordered the guides, read the books. But have you ever listened to a travel podcast? There’s one for every different kind of travel and every unique destination. A little bit of everything travel-related, the Extra Pack of Peanuts podcast appeals to the financially-conscious traveler, foodies and extreme sports enthusiasts. 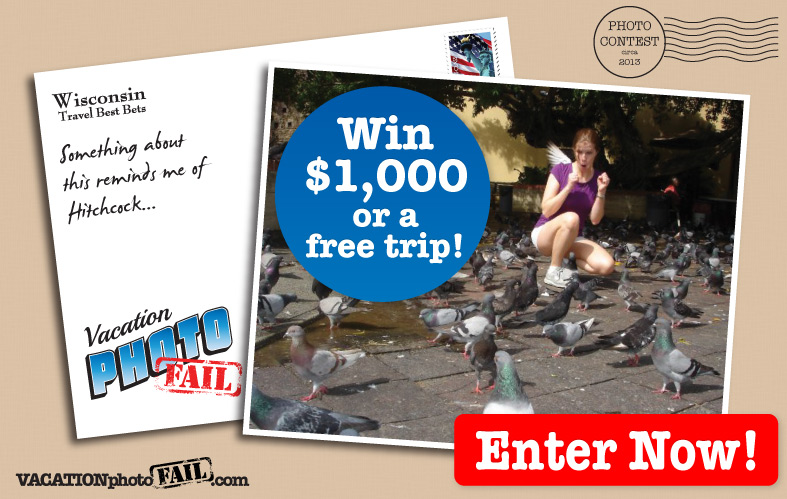 Zero to Travel showcases folks with incredible travel stories. Like the guy who participated in the 546-mile hitchhiking race around Scotland or the wheelchair-bound traveler who completed a 500-mile pilgrimage through Spain. If you’re interested in specific destinations, you can find some really thorough audio walking tours of Europe from travel guru Rick Steves here. Budget travelers will love the Indie Travel Podcast. You’ll find money saving tips and learn how become a full-time traveler (take that, career!). The official start of fall is just a few days away. Here’s a little glimpse at the travel outlook. It’s not all bad news. Fall is also “shoulder season” which means certain kinds of travel (and travel to certain places) are actually a way better deal this time of year. Check out these best cities in America for an autumn adventure. Thinking about how to market your destination for fall? 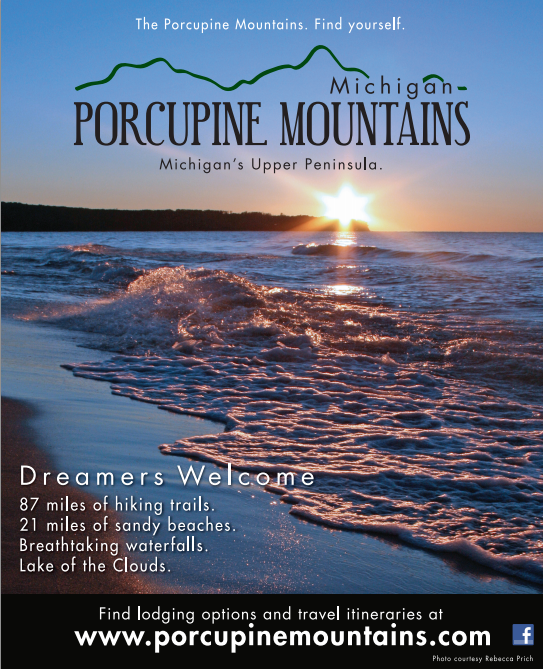 Tourism powerhouse Pure Michigan gives the season its own section of their website, including a color map, great fall activities and stunning imagery. No travel itinerary in your future? Explore this photo gallery of the finest fall color in North America. Did you know travel-related apps are the 7th most downloaded type of apps? So it begs the question, does my destination really need an app? And if you can ignore the fact that it’s a pitch from a place that makes mobile apps, this e-book has a lot of great facts and figures about mobile use in relation to tourism. Most destination apps are an extension of their websites and/or visitor guides. The clever ones include an element of fun, like the Middleton Pick-N-Play app we created, where users who aren’t sure what they want to do in town and just shake their iPhones and let the app choose for them. Another great concept for a travel app is to tap into popular activities in the area. For example, in the Map It Vilas County app we created, users can find the perfect trail for any activity and any season, and it even has filters for mileage and pet allowances. If you’ve got a lot to offer (like a whole country’s worth of stuff), you could go out all out, like the Hong Kong Tourism board did, creating a ton of different apps including a virtual tour guide with full panoramas and apps for island walks and heritage walks. P.S. Thailand went a little overboard too. However you choose to do your mobile app, just be sure you do it well. Wonky apps look cheap and research is showing that a good number of smartphone users don’t trust apps when they don’t know who’s behind them. Make sure your tourism entity is completely transparent in your descriptions. Where can you catch some fun? Rhinelander, of course. The Rhinelander area is the Heart of Hodag Country and home to some of the best lakes and trails in Wisconsin. The message of this bi-weekly e-newsletter is “Variety.” Oshkosh offers more than 1,000 events annually and a host of fun activities and attractions. Every e-newsletter gives the traveler dozens of reasons why they need to plan a getaway. 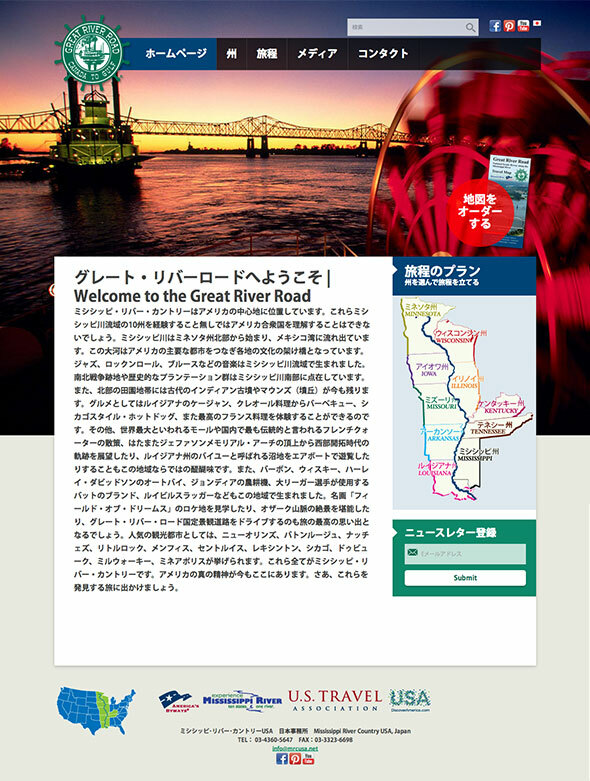 This Japanese-language website presents the riches of Mississippi River Country to Japanese travelers, group tour planners and travel writers. Everyone has an awkward vacation photo, and this contest invites one and all to share their embarrassing moments with the world. The entries were hilarious, the competition was fierce, and everyone was reminded why we go on vacations in the first place. 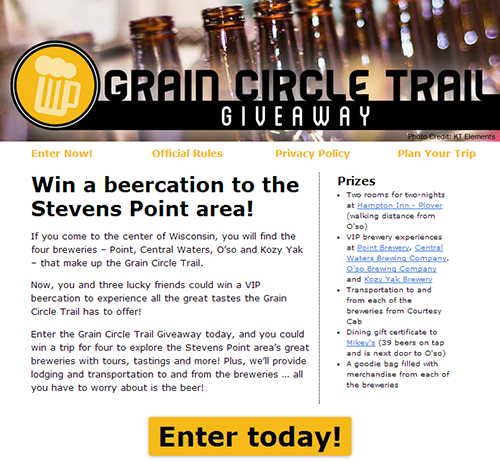 This contest promoting the Stevens Point area’s four outstanding breweries rewards one lucky entrant with a VIP beercation for four, including lodging and transportation. The focus is on the breweries and fun. Words can’t describe the beauty of the Porcupine Mountains. Images are the best way to sell this breathtaking place. There’s no destination quite like it in terms of scenery and solitude. It’s a place that beckons dreamers of every age, a place that welcomes them. Who wouldn’t want to go to a place like that?